"Scientific Software Builds Laser Targeted Email Lists, And Converts 14.7 More Of Your Visitors Into Buyers Automatically!" 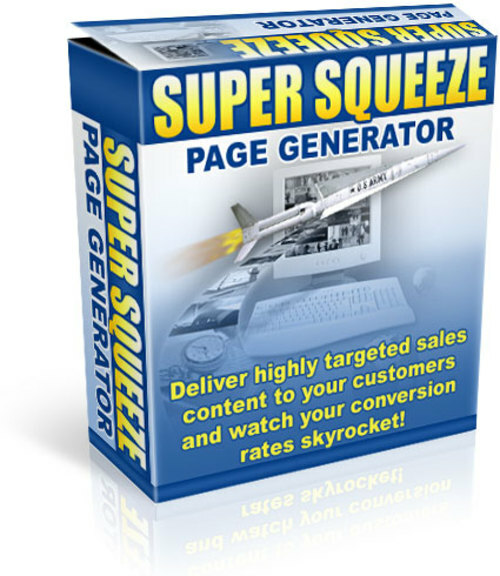 Install "Super Squeeze Page Generator" And Watch Your Conversion Ratio's Skyrocket Overnight! You Can now Quickly And Easily "Super Target" Your Prospects, Personalize Their Surfing Experience And Close More Sales! Lock the door, get planted in front of your screen and get ready for the response increasing breakthrough that is going to change your business! You've surely seen the hundreds of "flash in the pan" list building systems, pyramid schemes as well as the hundreds of e-Books promising to show you the secrets to converting more prospects. The truth about all these things is that fully 99 of them don't work. Signup now to get our 5 day e-course that includes the 10 most important things you must know about Squeeze Pages now! Without this information you are dead in the water before you even get started! Be Sure You Remove This Pink Text Before Launching Your Site! It is for setup instruction to you only! It's a beautiful thing to imagine...and it's now a reality thanks to a scientific list building and web conversion system that is nothing short of pure genius. Maybe you've been trying to make a living online and you just can't seem to get over that "hump" holding you back from living your financial dreams. 1) A targeted, responsive mailing list that you can mail on a regular basis. 2) A website that converts subscribers, visitors, and prospects into customers and clients. However, it's not as easy as it sounds. Thousands of businesses start online every day and thousands of businesses also fail and go offline everyday because they simply don't have a list and a well converting site. If you've been wondering what you can do to make your website convert like an Internet marketing guru's and produce more leads than you can handle all while turning your visitors into paying customers you've found it, Super Squeeze Page Generator! That's what nearly everyone who uses the Super Squeeze Page Generator experiences after using it for just a few weeks. Wouldn't you like to get in on that action? Build a super responsive list of hungry leads in record breaking time! Automatically customize your website sales copy to your users preferences on the fly. Increase your sites response rate and increase it over time automatically! Personalize your sales experience to each and every customer, no more Dear Friend, now it will be Dear Mark, or Dear Sally... Your prospects name will appear all over your sales letter! Everyone loves hearing their own name... no you can use it as your secret weapon! What Exactly Does Super Squeeze Page Generator Do? Makes ultra effective and responsive lead capture pages that grab your visitors e-mail address, names, and other personalized information. Personalizes the website by any variable you choose based on a question you ask them example: "What's Your Favorite Color Car?" Creates multiple sales pages automatically and tests the response on them to show you exactly which one is making the most sales. Places your prospects name right IN the sales letter for a turbo charged personalization effect. Let's you edit your pages with a built in WYSIWYG editor for complete ease and quickness. Tracks how many visitors went to each page, which page converted more sales and which answer was chosen most from your question. Display's the statistics for everything in a beautiful graphical interface for easy viewing and understanding. Sure there have been Squeeze Page makers and Lead Capture Page creators out for a while now but none of them did anything more than get an e-mail and send your prospect to a cold, unpersonalized sales page. Now you can make your visitors feel like your rearranging just for them when they show up like an old friend...that builds relationships. Extremely effective, automated, and truly fun to use! Your List Will Be More Targeted, I Guarantee It"
Super Squeeze Page Generator will show you the path that no Guru knows, after all, how can a Guru know what is going to make your site sell if they don't sell that same product or service? They can't accurately. Rest assured that your site is converting the MAXIMUM number of visitors into buyers. See for yourself why you site hasn't been converting and what to do to fix it! "Get My Quick Fix Training Mini Guide Sent To You Free Right Now Guaranteed To Solve All Four Or The Problems Listed Below!!" "What is the number one thing you want to teach your dog in the next 7 days?" Your prospect has checked the 4th option "Stop Chewing" and she clicks "Submit"
Your prospect is added to your email list and is automatically emailed your Tips Guide that you promised by your autoresponder. At the same time your prospect is delivered to your main sales page for your brand new Dog Training Guide! Are You sick and tired of your dog chewing up your best high heels or every thing else he can get hit jaws around? But wait..... what if marry selected Number 2 "Potty Train"
Are You sick and tired of your dog piddling on your brand new carpet, or even worse on your cloths in your closet? We are talking personalized content in your sales letter directed right at Mary by name, and specifically targeting her problem! Now you are here to rescue here and solve that problem! Now I am not just talking about a line or two of text customized to Mary's issue... I am taking about an entire web page totally tailored to exactly which box she checked and all personalized with her name over and over, all though out the sales letter! Think that will convert a few extra sales? Oh, did I mention the "Scientific Tracking Stats"
How many visitors clicked on which answer radio button and a conversion percentage of those clicks- then to top it off you will also see stats of how many visitors bought from each sale page! And that is just "One Campaign" You will have the ability to create an unlimited number of campaigns changing variables on each such at a new Super Squeeze Page Layout" or "A new question, with different answer selections"
By running multiple campaigns over time you will be able to turn your old webs site into a finely tuned sales converting machine! This Is The Single Most Important Sales Conversion Creator And Tracker You Have Ever Seen! I believe in the law of reciprocity which means I do something good for someone and eventually that will come back to me in one form or another. If I give you a break on this revolutionary system for taking your website and sales into hyper-drive, you'll come back and buy another product or service from me or better yet, tell a friend. I know how great this system is and I know you're going to be so jazzed when you start using it that you'll send me a letter of praise I can use to show my prospects which will make me more sales. You are only going to pay $127 for this cutting edge system for super charging your lead generation and website conversion. No Monthly Fee's Ever--- You Own It! Look at it this way -- $127.00 is really a painless drop in the bucket to soon have the ability to replace your current slave wage income with an incredible target internet based income all while building a massive email list! And To Be Perfectly Frank- Only A Complete Moron Would Not See The Power Of This "Conversion Creation Monster"
And get yourself ready to start earning big fat checks from your website starting today! Click here to order right now for only $127.00 (even if its 3:00 am in the morning). Requirements: PHP 4.0 or better, MySql, Ability to set file permissions to 777- This is a webserver based software not a desktop software! P.S. It's so easy, and it's guaranteed. If you don't make money after following the simple system with Super Squeeze Page Generator, we will refund you the purchase price of the book. Can you afford to spend 30 minutes a day on your financial freedom? Can you afford NOT to? Grab the software! You have nothing to lose and total financial freedom to gain! Don't waste another minute. Start your website empire and journey to total financial freedom right now!